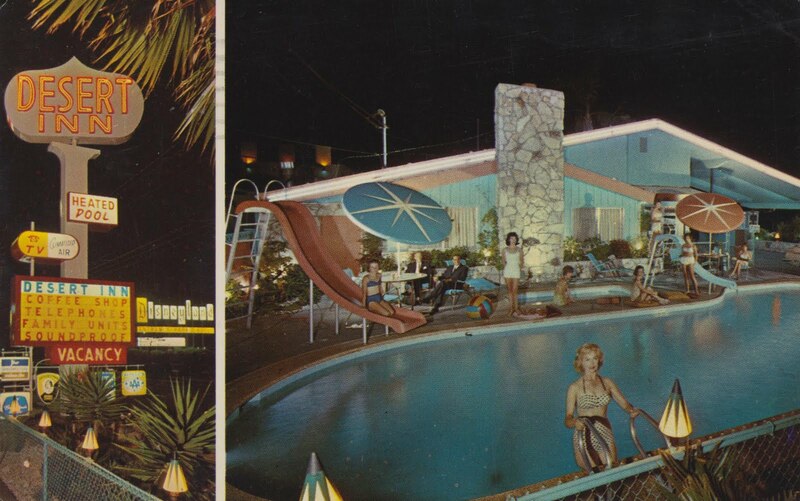 Let’s take a mini vacation in 1962 at the Desert Inn, Anaheim California. It looks like a great place doesn’t it? A Heated Pool (with TWO slides! ), phone, TV, A/C and Soundproofing? How cool are those lights on top of the chain-link fence? 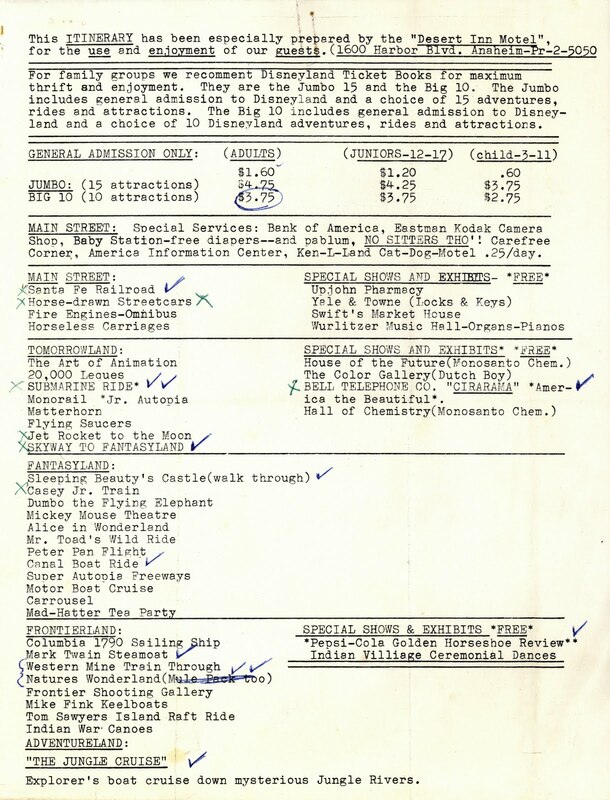 The Desert Inn has prepared this fine Itinerary of Disneyland for our use and enjoyment. I just dialed (714) PR2-5050 and the guy answered “Desert Inn Anaheim, how may I help you?” – Wow - talk about time travel! There are a few typos but it lends to the authenticity of using a typewriter in 1962 instead of Word2010. Free diapers, really? NO SITTERS THO! 25¢ to board and feed my dog, outrageous! What’s the “America Information Center”? The accompanying ticket books from October 1962 are naturally devoid of tickets – evidence of a good time had by all. 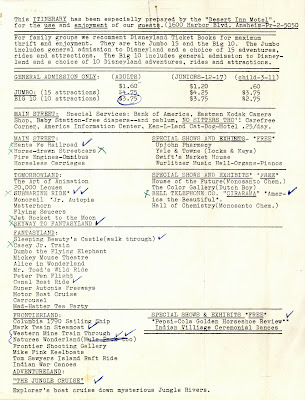 The attraction list with Tinkerbell favoring Tomorrowland (me too). Well what do you know; the tickets might be all gone but they left us a little trace. 2 A’s, 2 B’s, 3 C’s, 4 D’s and 4 E’s, yup, that’s 15 alright. Wow, so the Desert Inn is still around, huh? I guess I haven't paid much attention ever since the original signage on these kind of places was all made generic to fit in with the "Anaheim Resort" look. Being able to show the DL sign sitting right across the street from them must have helped their business...although it almost looks like just an extension of their own sign. That last pic gives me an idea. 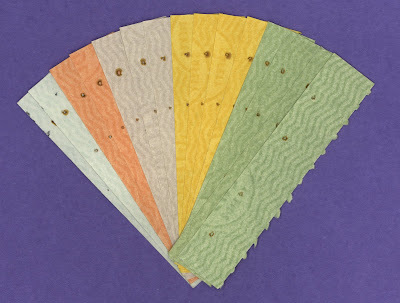 You should sell souvenir fans made up of laminated tickets and ticket books. Not the rare ones, of course! You had me at the "free diapers". I am so there! I love how they populated the pool area with fabulous babes for that postcard. I'll take the blond in the foreground! Awesome postcard and love the itinerary...great post, thanks for sharing these! Major, I'll take the one on the left. Join EverydayFamily NOW and you will get stage by stage pregnancy and baby email newsletters, offers and coupons as well as access to free baby samples, baby coupons, baby magazines & more.